To purchase, please finish configuring your vehicle above. Shown in polycarpet fabric. Sample rear deck. 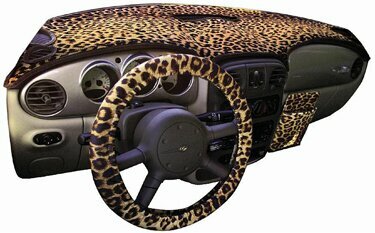 A Custom Dash Cover is a very conspicuous accessory - it is clearly visible to the driver and front passenger. 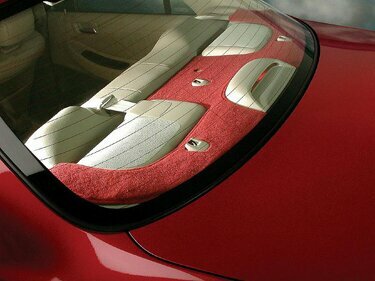 Therefore, fit and appearance are the most important qualities of a Custom Dash Cover. 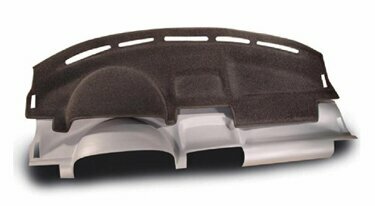 The fit is a result of the Custom Dash Cover's pattern design, construction and materials. Modern vehicle dashboards are complex, with subtle curved shapes, trays, cupholders, sensors, airbag cutouts, and other considerations. With a full time staff of professional pattern makers and advanced computer aided design (which was pioneered in the custom auto accessory field be Coverking 20 years ago), Coverking has the tools to assure a consistent, perfect fitting Custom Dash Cover. All Coverking Custom Dash Cover patterns are CAD designed from the original vehicle dashboard using sophisticated software. The process of making a Custom Dash Cover pattern takes upwards of 2 weeks but results in a perfect compliment to the original vehicle's dashboard. All cutouts, sensors, cupholders and airbag openings are studied and the Custom Dash Cover is designed not to interfere. Coverking Custom Dash Covers and Rear Deck Covers are constructed using a "zigzag" stitch. Other Dash Covers available on the market are made using a "blind" stitch. Every stitching style has an intended use, for Custom Dash Covers the optimal stitch style is the zigzag stitch. Coverking's zigzag stitch takes more time and is more expensive, but the results are worth the added expense - the stitch acts as a hinge, allowing the cover to contour the surface of the dashboard. A zigzag stitch also allows small pieces to be sewn together, because there is no margin. A blind stitch results in the dash cover curling into the stitch, it attracts dust, it lifts off the dashboard because material is underneath the stitch, and it prevents small pieces from being sewn together - due to the necessary margins. Coverking Custom Dash Covers have been selected over competitors by many automotive accessory retailers for their fit, materials, and construction.